Enjoy the health benefits of herbal teas! Teas are an easy, natural, and inexpensive way to enjoy the health benefits of herbs. Drinking herbal tea allows the health benefits of herbs to enter your bloodstream more quickly than capsules and tinctures. They are the secret tool against everything from hayfever to weight loss. Whether drank hot or iced, herbal teas allow you to enjoy the benefits of health and healing from the inside out. You don’t have to limit yourself to one herbal tea. There’s a huge variety of teas to choose from, with each herb offering multiple benefits. 1. Herbal teas help hayfever and allergies. Herbal teas made from elderberry and nettle can relieve stuffiness and congestion. Elderberry may also strengthen your respiratory system by removing mucus in your lungs. Nettle may also improve your blood circulation and is a good source of vitamins and minerals, including vitamins A, C, D and K; iron, and silica. 2. Herbal teas help your immune system. Herbal teas made from astragalus may help your immune system recover from surgery, antibiotics, and exhaustion. Studies have shown it revitalizes white blood cells, restores adrenal function, and stimulates the production of natural antibodies that your body uses to fight diseases. Drinking tea made from cleavers may also support your immune system. Studies show that cleavers acts as a lymph cleanser, removing lymphatic buildup and lymph toxins which can cause cysts, tumors, prostate infections, cystitis, eczema, acne, and more. 3. Herbal teas help with eyestrain. If you spend a lot of time on a computer, you may enjoy the health benefits of herbal tea made from eyebright. Eyebright has been shown to help with eyestrain caused from too much time on a computer. Traditionally, it’s also been used as a “bath” for eyes to relieve tiredness, inflammation, and eye infections and disorders. During the reign of Queen Elizabeth I, it was drank as an ale, and added to tobacco for bronchial colds. 4. Herbal teas help with weight loss. 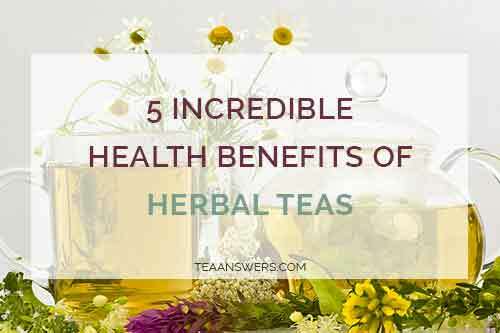 The health benefits of herbal teas include a natural way to lose weight by assisting digestion and elimination, preventing water retention, curbing appetite, and calming a sweet tooth. Dandelion may help your digestion and relieve constipation and bloating. Licorice may improve your digestion while curbing your sweet tooth. Ginger has traditionally been used to aid digestion and increase metabolism. Papaya has been used since the 1500’s to improve digestion and relieve constipation. Yerba Mate may increase your metabolism and curb your appetite between meals. 5. Herbal teas help PMS. Chaste berry and skullcap have been used through the ages to balance hormones and relive tension. Cramp bark may help with abdominal and back pain, and water retention. Dong quai’s high zinc and calcium content may relieve your PMS-related tension and depression. 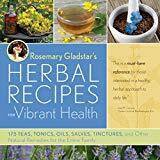 If you want to learn more about herbal teas, these are some great books covering a wide variety of herbs, their health benefits, side effects, and tips for preparing them.